Office Location | Tarheel Podiatry Center, P.A. Our office is conveniently located just off Tryon Road and close to the intersection of Routes 1 and 64. We are located right next to Danny’s Bar-B-Que and just west of WakeMed Cary Hospital. Our office faces Tryon Road. 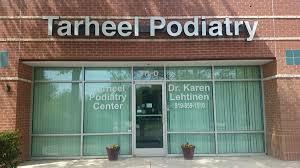 At Tarheel Podiatry Center, providing a great patient experience is very important to us. You’ll never be asked to leave a voicemail when you call. If you need information, have questions, or would like to make an appointment, we have a live receptionist available 24×7 for your convenience. At Tarheel Podiatry Center, we care about people, not just feet. Lunch time appointments available upon request. We accept Medicare, all Aetna products, Blue Cross Blue Shield North Carolina, Humana, United Healthcare and many more.